Hi ladies! How have you all been? I have been meaning to do this review for quite some time now but with the move and everything I didn't get around to it until now unfortunately. My skin is far from perfect - I have dryness, uneven skin tone, redness, blackheads, breakouts and also acne scarring on my chin and around my mouth. I would love to be able to walk out of the house without any makeup during the day but alas that has not happened for years. 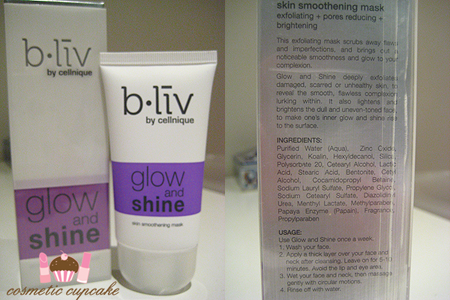 Selina from b•liv by cellnique was very kind to offer some of their products for me to try a little over a month ago. She asked me what skin issues I had and sent me some full size skincare products to try out. I had been looking for a new skincare regime to use as I wasn’t seeing significant results from my last skincare range. b•liv by cellnique also seemed like a company with a great philosophy so this was perfect timing. I have been using these products exclusively for the last 4 weeks. The products arrived quickly and were packaged really well. Straight off I loved the packaging of the products – sleek, clean, simple and appropriately packaged for the product. What they say: “This ultra-gentle exfoliating cleansing gel added with micro-beads helps you kick out impurities and remove excessive oil. The cleanser lets you say ‘hi” to clean pores and “bye” to those heads by making blackheads and whiteheads removal simple. 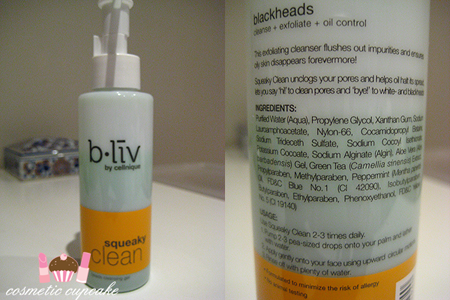 Squeaky Clean is the cleanser from the Blackheads range. It comes in a pump dispenser which is great and also includes a little stopper thing to prevent acidentally dispensing the product (I'm weird - I love these little plastic things because they make it easy to transport without getting it everywhere!). It has a grainy texture as it contains microbeads and smells sort of minty which took a little getting used it. The smell hits you 1st thing in the morning and wakes you up! Squeaky Clean lived up to its name for me and made my skin feel very clean without drying my skin at all. It feels very refreshing and I liked the gentle exfoliating effect. It also didn't break me out or cause any skin irritations which can occur when I switch skincare routines. I really like using it and I would definitely consider repurchasing. The only thing I dislike is that it is a small bottle and after a month I have used 75% of the bottle already. 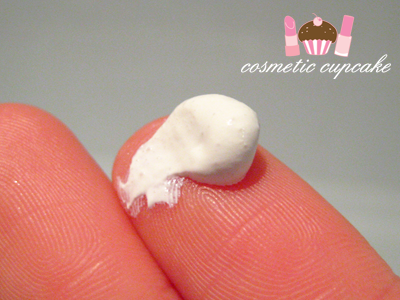 What they say: "Say goodbye to painful squeezing! This light cooling gel promises to remove stubborn blackheads and whiteheads painlessly in just 14 days of application and stop them from appearing ever again. It keeps excessive oil secretion under control and skin irritation will never rule again." Off with those heads is the blackhead treatment from the Blackheads range. It’s a clear gel in a pump dispenser also with a slightly sticky texture and a chemically smell. When you apply it the 1st time it does sting a little and unfortunately at first it can make the areas you apply it on quite oily. What they say: "A super lightweight gel moisturizer, Quench Me invigorates your skin with its moisture-retaining properties, keeping hydration locked in during daytime with no burden. Your complexion never looked more supple, recharged and healthy!" Quench Me is the moisturiser from the Dry range. 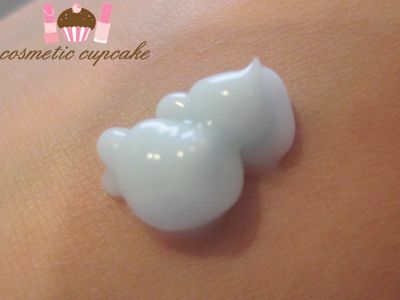 It's a lightweight gel (also with a pump dispenser) that’s pastel blue coloured and has a light smell. 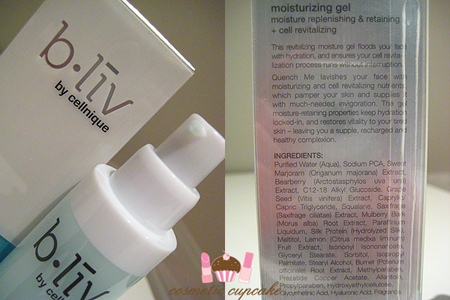 I really enjoy using gel moisturisers as they don't feel heavy on the skin. Quench Me absorbs very quickly into the skin and doesn’t feel oily or leave a sticky residue. It made my skin feel very soft and supple which was lovely! I felt however that it wasn't moisturising enough for my skin. My skin tends to get quite dry especially in Winter and I had some dryness around my nose and chin area after using this. It may work for other ladies whose skin isn't so dry though so give it a go. I wouldn't consider repurchasing this Quench Me. What they say: "Reveal your smooth and flawless complexion with this scrub mask. Glow and Shine deep cleanses, polishes and moisturizes your skin. It also lightens and brightens the dull and uneven toned face, and brings out the inner glow and shine. Scrub away flaws and imperfections!" Glow and Shine is from the large pores range. It is like a clay mask with little beads. It smells divine – like blackcurrants or something and you apply a thin layer after cleansing. It stings a little when you first put it on (I have dry cheeks) but I find this with other clay masks too. I ABSOLUTELY LOVE THIS MASK. This made my cheeks feel as smooth as a babies bottom from the 1st time I used it - I kid you not! Glow and Shine is definitely my favourite from all the products I was sent to try. My skin was SIGNIFICANTLY smoother and brighter after using the mask. The price is a little exxy but for all the good it does for my skin I am DEFINITELY going to repurchase. What they say: "A 3-in-1 hydrating mask, Leach Me moisturizes, prevents signs of aging and restores your healthy glow. Bursting with natural fruity ingredients, this mask acts fast in penetrating these nutrients into your skin. Your lines will refine, your dryness will vanish, and the mirror will reveal a beaming face once again!" Leach Me is a mask from the Dry range. It's a soft cloth sheet mask which I found very hydrating. The mask is FULL of serum - I left it on for 30mins and there was loads of excess serum. The serum took a little while to absorb into the skin but it was moisturising. I didn't see as much brightening effect as the Glow and Shine mask however I was only sent one mask to try so I can't say whether or not it lives up to its claims. The mask was a little too big for my face but I find most sheet masks a little big. I was only sent one mask but I would love to purchase more. 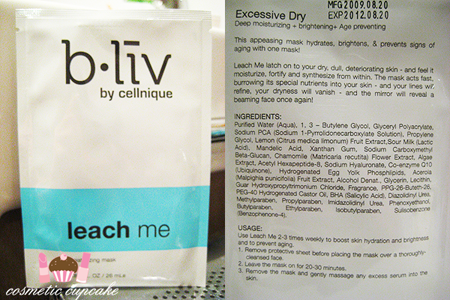 Overall, I am quite pleased with the results I've gotten from using the above b•liv by cellnique skincare products. My skin is still very far off from looking flawless but it FEELS better – smoother, healthier and cleaner. The products didn’t dry out my skin or break me out which happens sometimes when I change skincare products. I would definitely repurchase Squeaky Clean cleanser, Glow and Shine mask and Leach Me. 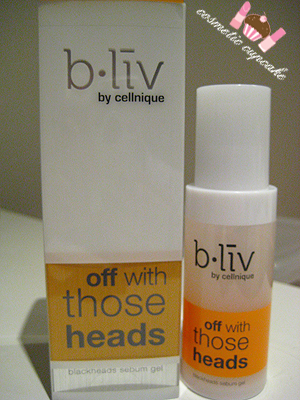 b•liv by cellnique would like to offer free samples of Off with those heads (3ml) to my readers! The first 50 readers who email their full name and mailing/shipping address to fbfreesample@blivskin.com with the subject cosmeticcupcake.com will receive a sample. Readers that send in their blog’s url might stand a chance to do a product review too! This great offer ends 1 week after my product review being posted and sample delivery within 4 – 6 weeks. 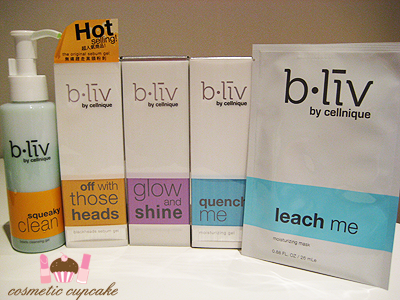 A big thank you to Selina from b•liv by cellnique for providing me with products to sample. You can purchase b•liv by cellnique skincare products from their website . I LOVE this brand, I still use it. Works great with my skin. I was just wondering if it is okay to use Squeaky Clean day and night and every single day since it is exfoliating and has beads? I was inquiring about an exfoliating cleanser in a certain store and the SA told me that it is only advisable to use the cleanser 2-3 times a week since the facial skin doesn't renew itself that fast. Won't using the cleanser everyday ruin/damage your skin?? 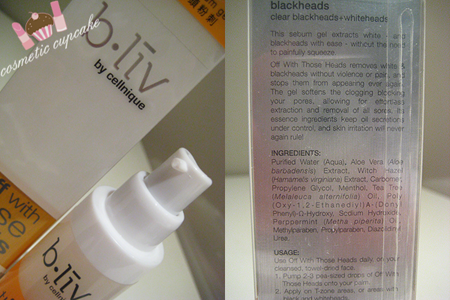 I'm using the off with those heads and I like it compared to the other brands that I've used to get the blackheads off. but its way expensive to keep up with the treatment. I'm not a beautician or makeup artist or anything unfortunately so I can't give you a definitive answer. What you've mentioned is a very good point and in theory yeah it probably might be a little harsh on the skin. However I found that Squeaky Clean was gentle for my skin and it's looking better after using it. @jellytelly_ri-chan: I haven't tried any other brands unfortunately so I can't compare but I agree that is quite pricey!